Randy Waldrum previously managed Trinidad and Tobago's national women's team. 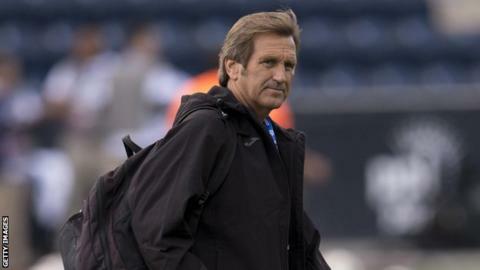 American Randy Waldrum has been appointed as the Technical Adviser of the Nigeria women's team. The 61-year-old replaces Florence Omagbemi, whose contract expired after leading the Super Falcons to an eighth women's continental title last year. Waldrum managed Trinidad & Tobago's women's side between 2014 and 2016, and his appointment is subject to contract terms being agreed with the Nigeria Football Federation (NFF). He was fired as coach of the Houston Dash women's football team in May. His immediate task will be to secure a qualifying spot and retain their continental title at the 2018 Africa Women Cup of Nations in Ghana. But Waldrum's biggest challenge will be to seal qualification for the 2019 Fifa Women's World Cup in France - in what could be Nigeria's eighth record appearance at the tournament. Despite being one of the 10 names on Fifa's list for Women's Coach of the year, former Nigeria captain Omagbemi was 'shocked and surprised' after she was not reconsidered for the job. Nigeria are the only African team to have played in all Fifa Women's World Cup tournaments since 1991.